After the deaths of two hostages in a Sydney chocolate shop standoff orchestrated by a man who forced his captives to raise black Islamist flags, it is time to recommit to the struggle against the extremist ideology that twists men like him. We need to be intolerant of intolerance. As many Australians themselves have already clearly demonstrated in the wake of the attack through the wonderful anti-racist hashtag #I'llridewithyou, the correct response to such atrocious events is not blind discrimination against people on the basis of real or presumed religious identity or refugee status. However, unconditional condemnation of the extreme Islamist political ideology that may be behind this terrible attack -- and at least was used to justify it -- is absolutely essential, and is in no way discriminatory. In fact, any tolerance of such intolerance does not produce tolerance, but rather has paradoxical and dangerous results -- allowing illiberalism to flourish and letting violent events proliferate. No one knows this more than those who have lived on the frontlines of Islamist terror. I was in Australia in May to present my book, "Your Fatwa Does Not Apply Here: Untold Stories from the Fight Against Muslim Fundamentalism," which tells the stories of many people of Muslim heritage who have defied extremism, and have been its primary victims. They include people like Diep Saeeda who organizes public demonstrations against terrorist atrocities -- such as this latest one -- on the streets of Lahore, Pakistan, notwithstanding the threats that suicide bombers will target her protestors. After my lecture about the book at the Sydney Writer's Festival, which ended with the story of Amel Zenoune-Zouani, an Algerian law student killed by the Armed Islamic Group in 1997, I was surrounded and embraced onstage by a group of people of Muslim heritage -- all women and many in tears. They were refugees from Algeria and Afghanistan who had been driven from their own countries by fundamentalist violence, like that the Sydney hostage taker Man Haron Monis appeared to be mimicking. Some of the Algerians later told me how loyal and grateful they were to Australians generally for being so welcoming to them when they were forced to flee there in the 1990s, and that they were disturbed to occasionally encounter Muslim fundamentalists in their adopted country who reminded them of the ideology that had forced them from their homes. After I spoke at the University of Western Sydney, the Australian university with the largest Muslim student population, I was likewise overwhelmed by the support I received from members of the audience of Muslim heritage for my talk critical of fundamentalism. Many, including Afghans and Syrians, stayed afterwards to strategize with me about how to counter fundamentalists -- both in their countries of origin and among their current compatriots. They had good reason to be concerned about this issue. In July, a teenager from Melbourne, Australia blew himself up in Iraq in a market next to a mosque, killing at least three other people and injuring dozens. 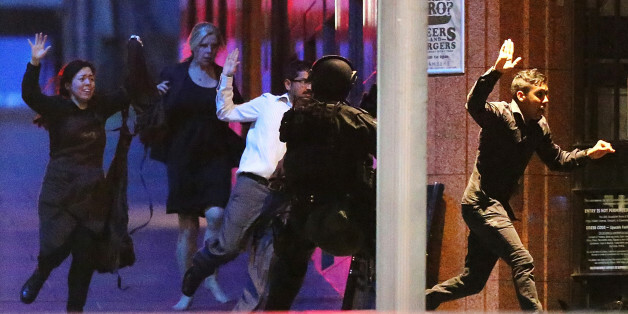 In September, Australian police arrested 15 individuals alleged to be plotting the public beheading of a random Australian in the same central business district in Sydney where the chocolate shop hostage crisis unfolded. ISIS has been calling for lone wolf attacks in Australia, amongst other countries, a call which has already resulted in a hatchet assault on a New York City police officer and a deadly shooting at the War Memorial in Canada. It is critical for human rights advocates, as well as security experts, to do all we can to prevent any further such violence, both to protect potential victims, but also to combat the frightening spread of anti-Muslim, anti-immigrant sentiment in Western countries -- as evidenced by the recent mass protests in Germany. We have to counter both the Muslim far right and the Western far right. In the wake of this most recent tragedy in Australia, I hope good sense will prevail. Muslims and refugees generally should not be held responsible for attacks which most of them deplore. That is entirely unacceptable. However, those who rise to defend Muslims and refugees must also unequivocally denounce not only terror, but the Islamist ideology that nourishes it. I hope there will be no attempts to explain it away by contextualizing or minimizing the real threat of jihadism. That too is unacceptable. The unprecedented (for Australia) Sydney hostage-taking is yet another reminder of the urgent need to discredit Islamist ideology, and to effectively counter the narratives that promote extremist violence. One of the best ways to do this is to support people of Muslim heritage -- like those I lectured about while in Australia -- who are fighting back against the fundamentalists. Meanwhile, the stories of the Muslim immigrants and refugees I met down under are also a reminder of the urgent need to prevent the manipulation of this terrible event in support of an anti-refugee narrative -- a development which would only harm many who have already been victims of Islamist violence and who are allies in the battle against extremism. We have to be equally intolerant of all of these forms of intolerance.